One of the major benefits of alternative medical practices is their actualization of methods that incorporate the whole body and all of its systems into diagnostic criteria and treatment methods. When looking at the body as ONE integrated system, rather than it’s component parts, patterns of illness and imbalance emerge. These patterns are unique to each child, but are part of a larger ordered pattern of body processes. Just as a farmer would look to find the source of disease if his crops began to fail rather than simply pulling out the plants that are ill, alternative medicines is guided by the understanding that the parts of the body work together and rely on one another to maintain a healthy environment. CranioSacral Therapy is one such “whole body medicine”. It is so named, because it relies on the subtle movement of the cerebral spinal fluid (CSF) housed between the cranium (head) and the sacrum (tail bone). The influx of CSF into and out of the cranial base causes a gentle flexion and extension of the whole body around the spinal chord as the CSF pressure increases and decreases in a wave-like motion. Because the entire body moves with the rhythm of the CSF, CranioSacral Therapists can feel areas of restriction in the body’s movements. Treatment consists of the gentle pseudo-energetic application of pressure to areas of restriction to remove any constraint. Like taking the tension out of an overstretched rubber band or the emotional release that comes with a well-timed hug, tissues in the body begin to unwind, eliminating restriction and improving local function. An older and more well-known “whole body medicine” is Chinese Medicine. This ancient healing art consists of acupuncture, acupressure, cupping, moxibustion, herbs, dietary therapy, energetic healing methods such as qi gong and tai chi, as well as, the more modern techniques of electric stimulation and laser therapy. The foundation of Chinese Medicine is that the body is one integrated operating system in which the internal organs support and control the functional activities of the other organs and the body as a whole. The methods used in Chinese Medicine are very gentle and work with the body’s natural processes to help strengthen and align bodily systems. Both of these systems of medicine can be extraordinarily helpful to kids with special needs. Dealing with the often immense health issues that come with certain disabilities, it is important to make sure that the body is functioning at its optimal capacity, so healing can occur wherever possible. CranioSacral Therapy and Chinese Medicine work with the body to ensure that it is working at its best, supporting growth and encouraging function. For more information, or if you would like to give these therapies a try, contact Bee Well Kids in Los Angles and/or Las Vegas, or search for a Chinese Medicine provider near you. As a traveling music therapist, I spend all day driving through the Texas sun, hauling guitars, drums, and tambourines from house to house, but still the hardest part about my job is answering, “What is music therapy?”. The American Music Therapy Association (AMTA) defines music therapy as “the clinical and evidence-based use of music interventions to accomplish individualized goals within a therapeutic relationship by a credentialed professional who has completed an approved music therapy program”. …Am I watching an episode of ABC’s Lost because I feel like I have more questions than answers after reading that definition! Don’t worry, because I am here to break down that definition and give you as many answers as possible about the field in which I work. First things first, what do music therapists do? My go-to answer for this question is to compare it to something everyone knows. Music therapists are similar to physical therapists, speech therapists and/or occupational therapists in that we are working with clients to improve their quality of life. The areas mainly focused on are physical, emotional, cognitive, and social needs. Through music therapy, clients learn social and communication skills; they learn how to appropriately express themselves through improved emotional processing; they can increase fine and gross motor skills; even stress and pain management can be learned through music therapy treatment. We are not teaching people how to play instruments, but rather using music as our therapeutic medium to increase those areas that are deficient in the clients lives. This would be the “clinical use of music interventions to accomplish individualized goals” of the definition. 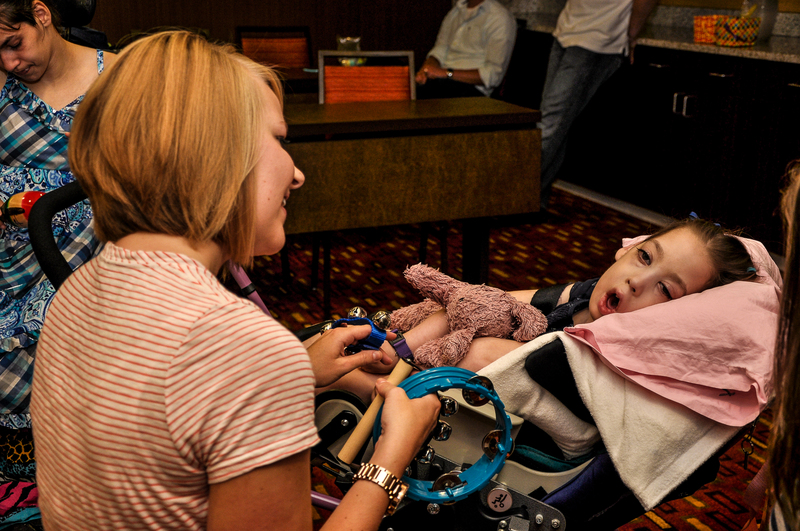 The second most common question is who can benefit from music therapy? The short answer: anyone! Really, it’s true. Music therapists across the US and throughout the world work with clients in all types of settings and with all types of needs, ranging from dementia to mothers in labor. AMTA has an excellent definition of who can benefit from music therapy. They say “Children, adolescents, adults, and the elderly with mental health needs, developmental and learning disabilities, Alzheimer’s disease and other aging related conditions, substance abuse problems, brain injuries, physical disabilities, and acute and chronic pain, including mothers in labor all benefit from music therapy”. So going back to the short answer, anyone with a general desire and enjoyment of music can benefit from music therapy treatment. With that being said, there is a common misconception that you have to be musical or have “musical talent” to benefit from music therapy, but that is not the case. Again, we are not teaching music, we are using the therapeutic properties of music to increase skill areas. Once someone learns about music therapy and what we as therapists do, the last question is usually where do you work? This is different for every therapist. I myself work through the Medicaid waiver program – CLASS – providing one on one, in-home services for children and adolescents with developmental and learning disabilities. I have also been contracted through school districts here in Texas to work with a few children with developmental and/or learning disabilities whose parents have requested music therapy to be incorporated into their child’s Individual Education Plan (IEP). And finally because I enjoy working with the elderly, I reached out to some local rehabilitation centers and am contracted through four nursing homes in the Austin, TX area to provide monthly group sessions for elderly dealing with dementia and Alzheimer’s disease. This may seem like a crazy set up, but I’m pretty sure my situation is the exception. Other therapists have private practices where they have a studio and all their clients come to them. Still other full time therapists work solely in hospitals, one school district, a nursing home, or a psychiatric facility. Going back to that initial definition, the “credentialed professional” is indeed the music therapist. We, as certified music therapists, do have to obtain at least a four year degree in music therapy. Most of us leave college with a bachelor of science in music therapy. We are trained heavily in music theory and music therapy as well as biology, psychology, social and behavioral sciences, and general studies. After we have completed all the course work, we are required to complete an AMTA approved internship usually lasting 6-9 months depending on when the student completes the required 1200 hours of clinical experience. Lastly, we are required to pass a board certification exam to become a board-certified music therapist (MT-BC). Throughout this article, I have continuously referenced the national association, AMTA because they do a fantastic job informing people who we are and what we do as a profession. If you have any remaining questions about music therapy, www.musictherapy.org is a great place to start. You can find therapists in your area, see where they are working and whether or not music therapy is funded through a waiver program or an insurance provider. I also have a website if you would like to know more about me or are in Austin and want to learn more about what I do in the area. Roads of Connection Music Therapy is where you can find my information. It’s common for people to still have questions about our field, don’t hesitate to contact a music therapist in your area to gain more insight.